This is part two of Siena’s birth story. To read part one, click here. Again, I’m being completely honest and open about my experience and if it makes you uncomfortable, please don’t read on! I know that my labor was longer and harder than the average labor, so please do not be discouraged while reading that you too will have a labor like mine. Every women experiences it differently (and even differently with each child) and I have read plenty of birth stories where women are pleasantly surprised that labor was not as tough as they imagined. It felt surreal as we drove the dark roads of Encinitas, making our way toward the hospital at 6 a.m. on October 3rd. I’d envisioned this exact moment so many times and now we were living it. As soon as we hit the first stoplight, I had another contraction. I was pleased because it meant my body wasn’t slowing down due to the change of scenery, as is often the case when women are on the way to hospital. I had one more in the 10 minutes it took to get to the hospital, and then another one in the hallway as we walked down to check in. I focused through yet another contraction as I filled out the paperwork (we had already done a pre-registration but there were more forms to sign) and then we were escorted to our labor room where I was asked to leave a urine sample, my blood pressure was taken and blood was drawn. I decided not to change into a hospital gown and instead left on my hot pink maternity dress with my nursing bra underneath. I immediately told Mike to get out our birth plan and had him hand it to the nurse, who read it over. Later, when another nurse came in I heard her tell her that we were doing a Bradley birth, even though my plan didn’t blatantly state it. One of the first things on our birth plan that I didn’t follow was that I did get a hep-lock, which is basically an easy way for the doctors to hook me up to any requested or necessary IVs while in labor. I had originally included in my plan that I didn’t want one at all, but I had been on the fence about it since I knew in an emergency it was good to have so when the nurse somewhat insisted, I said yes. It was a little uncomfortable but the good news was that I could still shower and do anything else with it on. The next step to admission was to have my cervix checked and to have the baby’s heart rate and my contractions monitored. I had stated on my birth plan that I wanted as few cervical checks as possible and that I did not want to know how dilated I was. 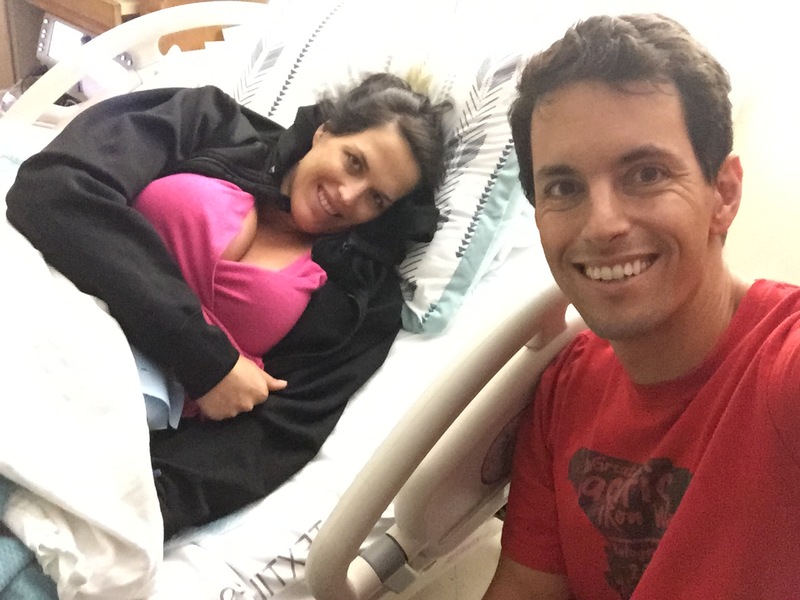 I had read too many birth stories of women laboring hard and finding out there were only a 3 or 4, causing them to be discouraged and get the epidural, and then progress quickly and have the baby a few hours later. Our Bradley teacher also warned us against this. But when they checked me, I couldn’t help but say, “Please only tell me if it’s good news.” The nurse said, “What is good news?” after she dug her fingers around inside me (it actually didn’t hurt at all in comparison to the contractions) and I said, “an 8 or a 9.” She then said, “Well it’s not an 8 or a 9, but it’s very good news.” And of course I said, “OK TELL ME!” She said I was almost completely effaced and a solid 6, maybe 7. She said based on the way I’d been handling the contractions, she was extremely impressed and the other nurse agreed that the “hardest part” is getting to a 5 (I look back and laugh at this) and then it goes quickly. I took the news as a great sign and was happy and hopeful that we were on our way. At least all this hard work was making progress. I also was encouraged by her statement that I was handling the pain so well and it gave me even more confidence that I was going to be able to make it til the end. Strapped into the machine for the first time. The last (of very few) photo during labor! 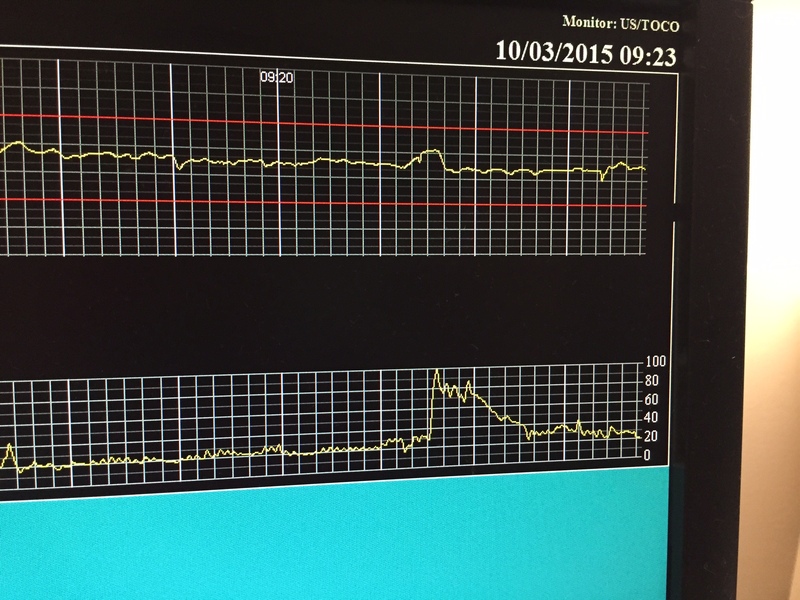 Next, I was strapped down and we could watch the baby’s heart rate and the contractions on the monitor. As expected, it was NOT comfortable to be lying down, and I couldn’t wait to get off the monitor. One unexpected labor symptom I was having was the constant need to empty my bladder. I had literally been going pee 10 times an hour, and pretty much after every major contraction. While on the machine, I could not use the restroom and it became increasingly uncomfortable. 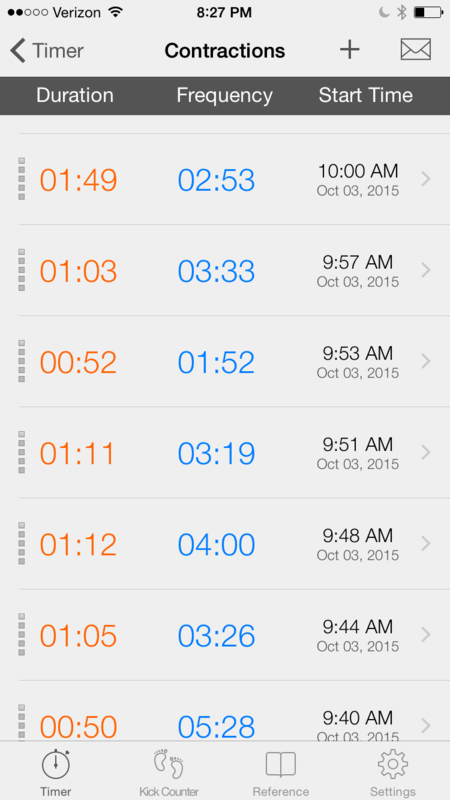 Mike started to time my contractions again at 7:15 AM. They were now coming very close together and the intensity was getting worse. The monitor also showed that I was having more contractions that I had even felt before and the nurse confirmed that “all contractions count,” even the ones I wouldn’t have counted before since they weren’t as intense. 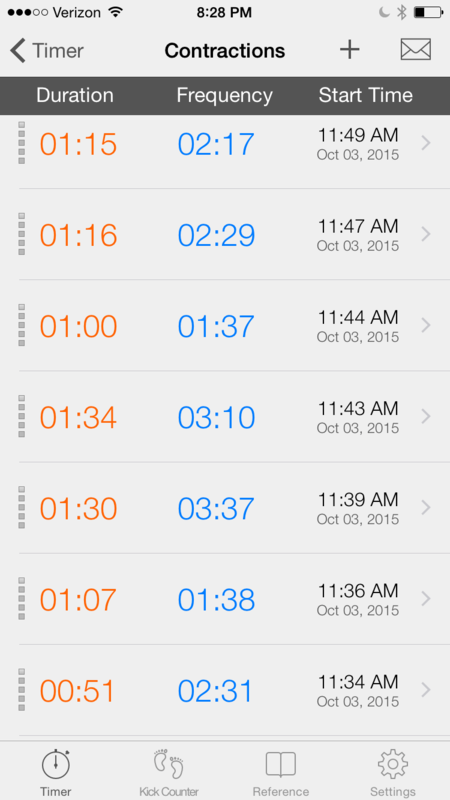 I started wondering if we had been timing incorrectly earlier and that is why they seemed all over the place. Maybe the smaller contractions weren’t getting counted and it was making it seem more inconsistent. 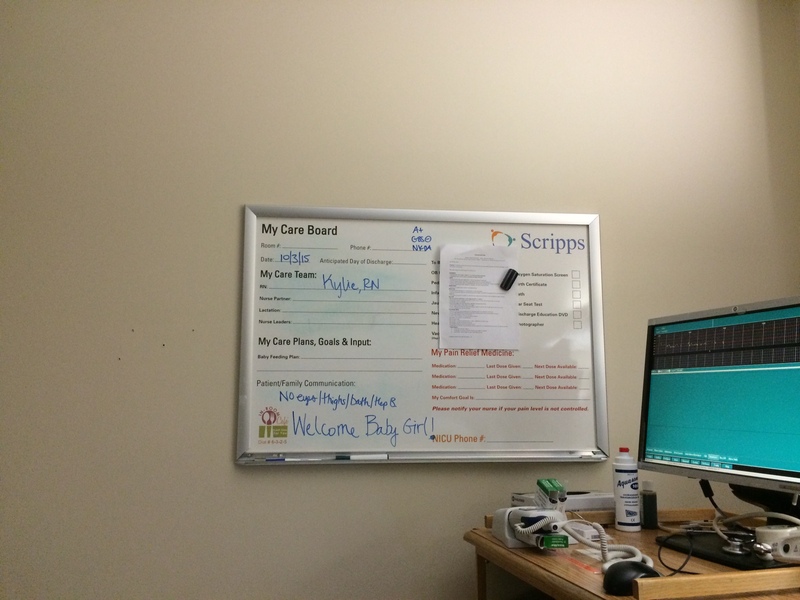 While I was being monitored they told me that they really wanted the baby’s heart beat to be a little more variable during my contractions, so they wanted me to stay on the monitor longer. I was surprised to hear this as I assumed it was great that her little heart was unwavering, beating away at the usual high 130s/low 140s. Later, we learned that this was an early sign that she had her first bowel movement of meconium in the womb (common in past due babies). The nurse shift change happened while I was strapped in, and although I didn’t dislike our previous nurse, I immediately really liked our new nurse, Kylie. She was extremely supportive of our birth plan and never once mentioned pain medication or pitocin to help move things along. We spent the morning moving around our small hospital room, working through the contractions. I’d labor bent over the bed, on all fours on the bed, bracing myself over the tall trash can inside the bathroom, or on the toilet. We had brought the heating pad from home and Mike would press it on my lower back during contractions which would take a bit of the edge off. Between contractions I’d walk around the room, rock back and forth on my feet or even lay my head on Mike’s shoulder. Mike later told me that I resembled a zombie from the Walking Dead as I’d shuffle across the room, eyes partially open or even closed, a dazed look on my face. I tired to stay as hydrated and nourished as possible. Before we left for the hospital I had 2 pieces of toast and at the hospital, in addition to the insane amount of water Mike helped me drink, I drank glass after glass of this amazing mango flavored juice that the hospital provides (with crushed ice, my pregnancy addiction), ate a banana and a few pita chips, and took 2 non-caffeinated Gus. I think the juice itself probably was the lifesaver since I’m sure there were 200 or more calories of pure carbohydrates per glass and I drank at least 7 or 8. It’s hard to explain just what the contractions felt like, but I’ll try. Bradley Method had taught us to think of each contraction as a muscle working, opening the door (i.e. the cervix) for the baby to come out. Mike had said to me over and over before labor started just to “Imagine the door opening for Siena.” I’m here to tell you that contractions do NOT feel like a muscle working. The contraction would start as an ache and an intense tightening in my low belly and then work its way up and over my entire stomach, wrap around my back and radiate down my inner thighs. Simultaneous to this corset of death wrapping its ugly talons around my body, I literally felt like someone was taking a screw driver and digging into my insides. I also compared it to being eaten alive by a zombie. It was the most excruciating pain I’ve ever felt in my life and absolutely nothing like the hard but manageable pain of running repeats on a track like I had imagined. The one grace that your body gives you is that the contractions usually only last 60 seconds and you are afforded a break between. However, at some points, my contractions were up to 2 minutes long, double peaking and as soon as I’d catch my breath and stop my animal-like groans, another one would come on and I’d be doubled over once again. At some point, I started to feel the urge to push and I asked Mike to call the nurse in to check me. I was convinced I was there, and was disappointed to learn I was only a 9. How could I want to push and not be fully dilated? I started to question if I just was convincing myself to push because I wanted a change. At this point is when I asked if the doctor could break my bag of waters, another thing that was not in my birth plan. I had heard via birth stories I read (not from Bradley Method) that breaking the water would help me progress and the nurse agreed. Unfortunately my doctor (who was the on-call doctor; both doctors in my practice were not on call on a Saturday) was in surgery so we had to wait. While I waited I got in the shower, which was a welcome change, but there wasn’t a great place to brace myself. During contractions I would let myself push a little bit even though I knew I wasn’t supposed to. The doctor arrived while I was in the shower and she agreed I was only a 9. She tried to break the bag of waters with a long stick called an amino hook. I felt the doctor trying to break the waters but unfortunately (or not since that was a good sign) her head was SO low in my pelvis that there was no way to break the bag. Instead she punctured it and created a few small holes, but apparently this wouldn’t actually speed up my labor since her head was blocking the birth canal (at the time they didn’t tell me this but later the nurse said so). During transition I was still forced to be monitored for 20 minutes at a time. Luckily they allowed me to stand up during the monitoring (which was more like hunched over the bed). However, I couldn’t stand for the monitor to be on as long as they wanted it to be and twice I removed it before they came back in to take it off. The urge to pee was incredible and coming after nearly every contraction. Several contractions later, I begged to be checked again. I felt like I was moving in and out of a dream; it was an out of body experience and at times I’d imagine myself floating over my laboring body, looking down at myself in disbelief. I remember thinking I was in a very dark place several times. I started cursing myself for ever considering a natural labor and dreaming of relief (I’ve had those same thoughts during the ironman and every marathon I’ve ever run). The nurse checked me and sadly told me I was a 9.5. There was a tiny lip on one side that would not move. I ask if she could move it for me (also read that in birth stories) but she said since it was my first birth, she couldn’t. I started to cry again (I think I cried more in labor that I did my entire pregnancy! ), and let out a big sigh. I moved back into the shower, hoping that the hot water would progress. In the shower again, I felt the urge to push and it was even greater than before. I was letting myself go a little with the urge to push, although the doctor had warned me not to. The contractions were taking over my entire body and coming so fast and furious together that it just seemed to blend into one long contraction. Suddenly, all I could think of was relief. I couldn’t do it anymore. I told Mike that I almost wanted a c-section to just get it over with. Through tears, I told him to ask the nurse to come back and if I wasn’t a 10, I was going to get pitocin and an epidural. I literally couldn’t stand one more second of this living hell. I began to cry again, shuddering and shivering through the contractions. I felt trapped. Just as this decision was being made in my mind, my mom knocked on the door (she had been in the waiting room since 9:30 AM!). When she came in, she found me bawling hysterically and she immediately said “Get the pitocin! It’ll speed it up!” and I told her “If I get it, I’ll have to get the epidural,” which sent me into a complete melt down. I was like a toddler who had their favorite toy taken away – I bemoaned that all my hard work would be for NOTHING if I got the epidural. Mike tried to talk me out of it but he eventually conceded. I asked the nurse to set up the squat bar at the end of the bed. I’d been practicing holding a deep squat for the last several months of my pregnancy because it is the most efficient way to push as it shortens the birth canal. The bed has two segments and the bottom segment was lowered so that there was a higher platform at the top and a lower platform at the bottom. The squat bar was set up between these two platforms. As in my birth plan, the nurse did not direct my pushing, but she did give me advice on how to push. She told me to hold my breath and push for at least ten seconds, then take another breath and do it again. She encouraged me to get at least three good pushes per contraction to move things along as quickly as possible. I had heard that there is relief in pushing because the contractions slow down and are less intense than transition, and the effort of pushing is welcome after laboring for so many hours. At first, my contractions really did slow down. They stalled enough for me to be standing on the top portion of the bed, waiting to get down in the squat for a while, wondering when it would come. For the first time in hours I was wishing a contraction to begin, not begging for it to stop. Finally, a contraction came and I got into the deep squat on the lower level of the bed, my arms supporting me on the squat bar. However, when the contraction actually came and I got into the squat, I found it very hard to actually hold my breath and push through it, as the pressure of the position and intensity of the contraction were making it very painful. I squatted for a few pushes, never making it to the count of 10, and then stood up and tried to push, but I knew that wasn’t getting me very far. After a couple more squats (I’d move out of the squat after every push to rest), I moved to my hands and knees, facing the top of the bed. Pushing in this position felt the best as it was the most relief from the intense contractions, but I wasn’t making great progress here either. The nurse suggested the side lying position so I moved into that, which ended up being the best position. I pulled my lower leg up and my upper leg would push against the squat bar for leverage. During the pushes, Mike would count to ten for me which really, really helped. The nurse was really encouraging while I was pushing in this position – she said she could tell I was making the most progress here. Occasionally she would put her fingers inside me to feel the baby’s head and also feel how strong I was pushing. However, the contractions seemed to have picked up again and I found that no matter how hard I tried, after two, sometimes three pushes I would have an aching cramping (similar to a Charlie horse feeling) in my right glute and lower back and the only way I could get relief was to flip myself onto my hands and knees, with Mike pushing on my lower back. Once on my hands and knees, the contraction would peak and I would be wracked with pain. I could not push during that portion of the contraction, although I would try (and rarely made it to 10 seconds). After several contractions like this, my body started to take over every time I moved into the hands and knees position. The contraction would peak and then my body would literally take over and force me into an excruciatingly painful push. During this part, I would let out the loudest, most primal groans and cries yet – I felt connected to every laboring animal on the planet in those moments. During every contraction like this, I was convinced the baby was going to fall right out of me. However, the doctor hadn’t even arrived yet so I subconsciously knew that I had a ways to go (although the nurse did tell me she has delivered several babies because the doctor didn’t come in time). At some point the doctor did arrive, and she also put her fingers inside to feel the baby’s head and see how much progress I was making during pushes. She encouraged me to stay on my side as that was definitely the most effective position. They had already told us that the baby had her first bowel movement in the womb (and I could tell because I could see the brown liquid dripping out of me with every push, along with the blood that had continued to come out since my first cervical check) and that the NICU staff was going to be present for her birth so that they could make sure all of the fluid was out of her lungs. Now that I knew baby could be in danger, I was on a mission to get her out. I forced myself to no longer get on my hands and knees after the side lying pushes, and had a whole new vigor during pushing. During each push I would use every single muscle in my body to move her out. I would try to hold my breath as long as possible and push as many times as possible during a contraction, sometimes 5 times (usually three count of 10 and then a couple shorter pushes at the end). Soon, her head started to make an appearance. I reached down and felt it and almost cried with relief. She was almost here! My pushing took on a whole new intensity and I was grasping Mike hard while I pushed, likely hurting him too. He continued to count along with me and the doctor and nurse were encouraging. I was pushing so hard that I was incredibly hot, sweating like crazy despite the room apparently being very, very cold. Mike asked for a cold washcloth and put it on my face and forehead for relief. Mike told me later that he was worried that I was going to hurt myself I was pushing so hard! For the next several contractions, I imagined that she might come out every single time. I really believed it, which helped me stay motivated. I was convinced that any push would send her out of me. I pushed and pushed and pushed, clutching on to Mike for dear life. Give me my baby, give me my baby, I would repeat in my head. Soon, I felt the good old Ring of Fire (which for the record, is not nearly as painful as the contractions were in transition). I knew that she was nearly here! I also knew it was time to back off a little on the contractions so that I could stretch my perineum slowly to avoid tearing. I tired to hold back a little bit (the Ring of Fire pain helped motivate me to do so). The doctors told me to keep going and that she was almost here, and I started pushing again, as hard as I could, groaning and moaning between periods of holding my breath. At times, it felt like an out of body experience – I couldn’t believe it was happening. Soon, her head was out! I almost stopped there but the doctor told me to keep going. Her shoulders and body came out with another push and I’m not sure I even realized she was out because I was laying back in pure exhaustion. The doctor had to tell me to look down and she was holding my baby girl in her arms. I said “She’s huge!” (She’s was definitely not huge at 7 lbs 11 oz). It was the best moment of my life. Mike and I both broke into tears and hugged each other tightly, crying on each other, repeating “She’s here!”, full of equal parts happiness and relief. They immediately whisked her off to be assessed due to the meconium in the bag of waters (I never did feel my water break, it must have just slowly leaked out – or honestly it could have broken and I was too in the zone to notice). The transformation of the room from a dark, quiet refuge for a laboring woman into a bright, noisy and chaotic medical scene was dramatic and sudden. Mike went over to the warmer where she was being assessed (he also cut the cord) and I was left with the doctor, who began to encourage the placenta to come out. I asked her why we couldn’t let me labor it out naturally and it was obvious that she was worried about something. Once she got the placenta out, along with more blood than I’ve ever seen in my life, she put her hands inside me to massage my uterus. It was not clamping down as it was supposed to, likely due to the 45 hours of labor it had just endured, and I risked hemorrhage. That hep-lock I hadn’t planned on having was now very important and I’m thankful I had it. The doctor asked the nurse to hook me up to pitocin (she did acknowledge that this wasn’t in my birth plan and I said I was ok with it) as well as one other drug. She also asked when the last time I urinated was, and I said before pushing. This is when I found out that I had been pushing for 3.5 hours. I had no idea how long it had taken (the average woman pushes 30-60 minutes). The doctor put in a catheter to drain my bladder, telling me that was probably part of the reason my uterus wasn’t reacting and then put her entire hand inside me to massage my uterus and bring out any remaining pieces of placenta. I was a bit dazed from the delivery and the pain of her hand was uncomfortable, but again, nothing compared to contractions so I just breathed through it. I was disappointed that we did not get to have our delayed cord clamping and immediate skin to skin time, but of course I have no regrets since the health of both baby and mama come first. 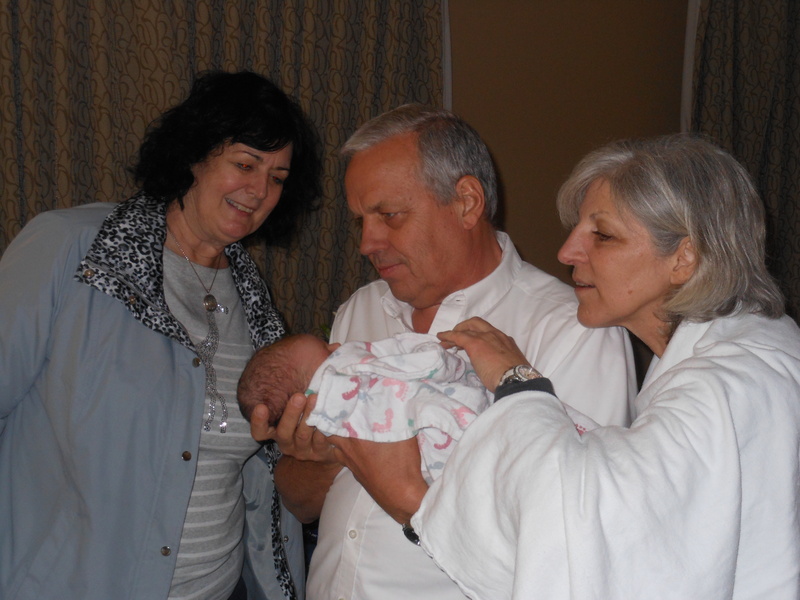 Luckily, Siena was totally fine despite the meconium and she was soon placed on my chest.I loved her the instant I saw her and fell even more deeply in love as she laid there on me. Mike was by my side and we looked down at our newborn baby and repeatedly exclaimed that we just couldn’t even believe she was finally here. Thanks to the perineal massage, I did not tear there, but did have a few small tears in my labia, which the doctor stitched up. She numbed me in parts but I could still feel the stitches going in, which was uncomfortable to say the least. After all the stitching was complete, everyone left the room so that Mike and I could have our “magic hour” with Siena to bond. However, one nurse stayed back to help us with our latch. I immediately learned that breast feeding a newborn with no head control takes some serious coordination, but she latched right on and our bond became even stronger. Could not have done it without this guy! During our magical hour, Mike and I stared at the most beautiful thing we’d ever seen and briefly rehashed the labor. We were both still in shock from it all. Mike and I hadn’t really communicated verbally more than a few commands I gave him and the non-stop encouragement he gave me during labor. The majority of our communication had been non-verbal – we had just spent 45 hours side by side getting though this incredible feat yet it felt like I hadn’t talked to him in forever! I told him immediately that I could never have done it without him. His unwavering support, patience and coaching made me fall in love with him even more. And now, watching him as a father has strengthened that bond even more. So, was it all worth it? Yes. I would never trade my birth story for anything and I wouldn’t change a thing (ok, maybe I’d like it to have been shorter!). My recovery from labor has been incredibly smooth and I almost feel back to normal, although I’m still taking it very easy to allow my body to heal from the trauma it experienced (nursing kind of forces you to relax!). We’ve been told repeatedly what an alert baby we have and she eats like it’s Thanksgiving dinner every day. However, I totally understand why people chose to use pain relief in labor and would never, ever think differently about anyone who choses that route. That wasn’t the direction I wanted to go, but I respect everyone’s personal decision about their own labor. If you have any questions that I didn’t answer here (maybe it’s not possible since I basically wrote a mini-novel), feel free to reach out to me! 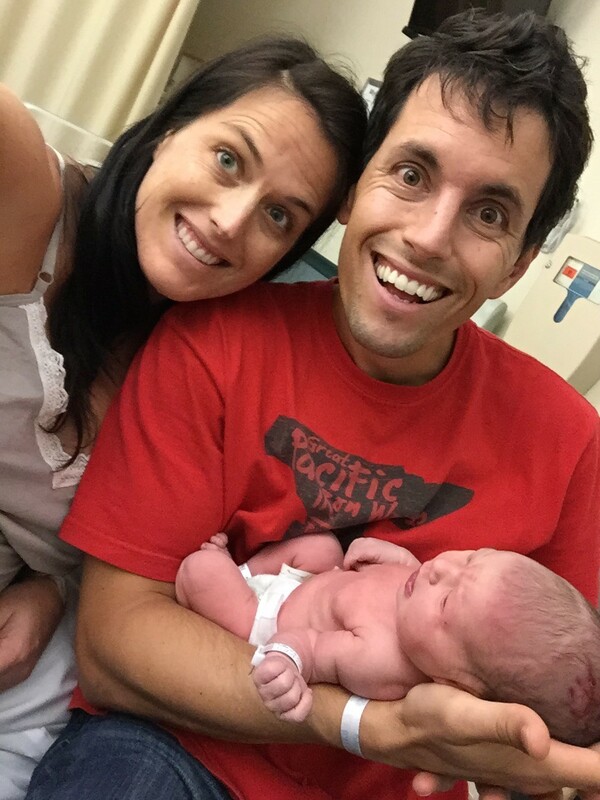 First family selfie after we got to the recovery room – We’re tired but happy!! Incredible. I love how right when you thought you couldn’t do it anymore – you were THERE! I also love that you removed your monitors a few times, you rebel! No, it really is great. If I ever birth in a hospital someday (I plan to stick with home births, but you never know) I can see myself sneaking them off too, hehe. What an awesome adventure! I must say, your birth story was a LOT like mine! Even down to the lip of the cervix not opening (my doctor massaged it for me but let me tell you, it was painful!) The parts where you felt like you were out of your body or on a journey somewhere. I’m so glad everyone is healthy and happy! Nursing is another adventure of its own but worth every second! Thank you! And that’s crazy how similar ours were! agreed that nursing is its own adventure ! Wow wow wow! You are such a trooper!!! I just cannot imagine 45 hours but you handled it SO WELL!! Congratulations to you and Mike. Siena is beautiful! First of all many congratulations to you, Mike and your family. Your baby girl is incredibly beautiful and I really hope that you cherish every moment of her life! I really wanted to thank you for sharing your story with us all. You wrote all the possible details which is truly great since it will help all the women out there that are preparing for their pregnancy. I also wanted to say special thanks since you must have written these [super helpful] blog posts within days of having your baby, which I think is a Herculean task in itself! Good luck with everything and I hope good health to you and baby Siena! Wow, You are incredible! Amazing birth story. I can’t believe you didn’t give in. That is the true spirit of an Ironman right there! Siena is beautiful, Congratulations. I’m glad your recovery is going well too! She is gorgeous and you are a superwoman!! I can’t believe you labored for that long. You are incredibly strong. I’m so glad you and baby are healthy and recovering well!! Thanks Sara! It was a battle but worth it! Yes Bradley method was amazing! The classes are so informative and there are so many great tips on how to manage pain in labor. I definitely couldn’t have done it without Bradley. I loved reading your story… thank you for sharing such an incredible, intimate experience with all of us. 45 hours is almost unheard of!!! You were definitely in control, even if it didn’t feel that way at times when the contractions got really intense and painful. I know that feeling of being near the end and not knowing whether you are going to make it without the epidural. I have heard that those thoughts are completely normal. My doctor said I couldn’t have the epidural once I got past 8cm, so that made the decision easier for me. (I’m so glad too, because in the end I didn’t need it). You hung in there and had the birth you wanted – even if it took a little longer than you ever expected it would. It takes and a lot of mental and physical strength to labor naturally!! Way to go mama!!! I am glad to hear that everyone is happy and well. Siena is a beautiful little baby and I’m sure you are just loving every moment with your little girl. Can’t wait to hear about the first weeks at home and how you are adjusting as a new mom. I don’t even remember what life was like before being pregnant and having a baby. Crazy! P.S. Can you BELIEVE that pain!?! Wow wow wow. The female body is truly remarkable!!! Thanks Kristen! The female body really is incredible- I can’t believe what we can do with it. I do wonder why the contractions really need to be SO painful though?!? Haha! Post on life with baby coming soon ! Um, seriously. I don’t remember what life was life like before baby either!! Hahah. It’s so crazy how much thigs change. Thanks for sharing your birth story. so glad you had the natural birth you wanted even though it took a long time. That took some serious determination on your part. I’m also so amazed by how fast time flies when you are I labor sometimes. You are just so in the moment, you don’t know what the time is. I’m impressed you made it through such a long labor! It is amazing that once you hit transition, it seems impossible to keep going AND you’re almost there! 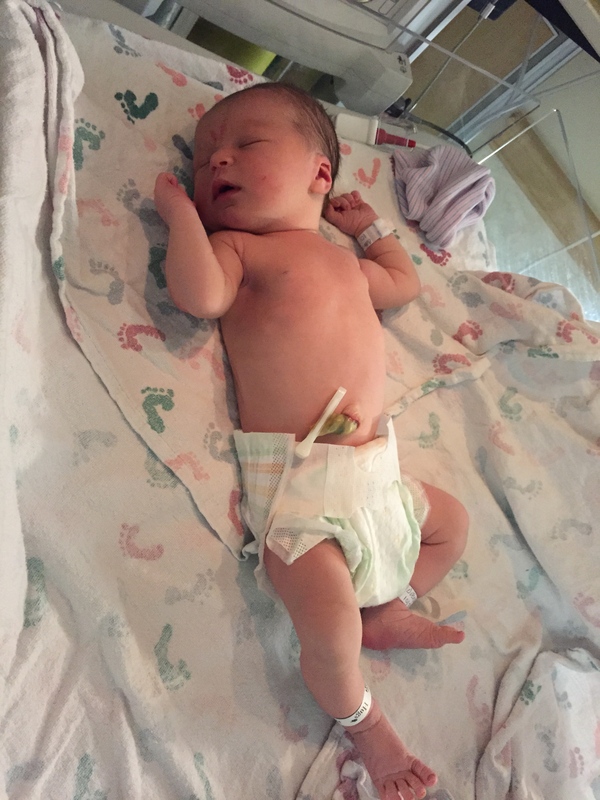 My daughter was due the day before Siena and born a couple of days before, so I’ve loved following your pregnancy chronicles and birth story. From one new mama to another, congrats to all three of you! Thanks Kimra! COngrats to you as well!!! 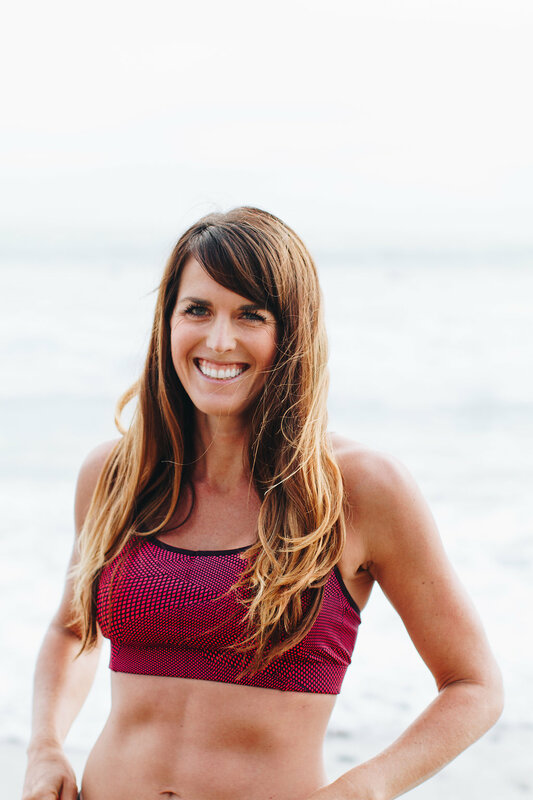 I have started following your blog years ago because of the fitness side ( I found it googling P90X + marathon) but I have found all its developments and changes dovetailing your life most captivating. I am 22 weeks pregnant at the moment and following your engaging pregnancy reports has been most enlightening and informative. Today after reading the story of Sienna’s birth I couldn’t help writing thanking you for having shared this. It is so helpful in so many ways, and so very touching. Despite the very painful and long hours you experienced and you so honestly describe, you made me feel much more confident about what is to come. Thank you again for your generosity and effort in sharing this amazing story, I wish you, your husband and your beautiful baby girl all the happiness in the years to come. And i will be eagerly following your return to fitness making notes! Claudia, thank you so much for commenting! 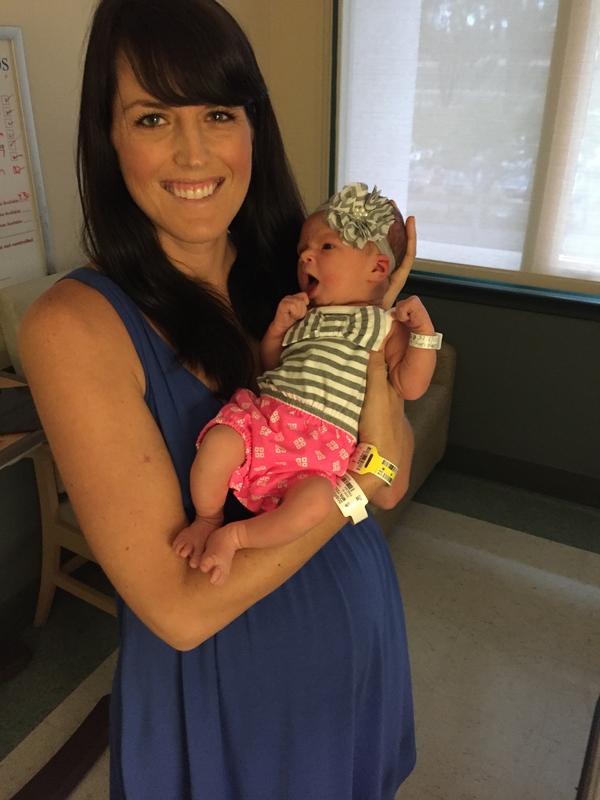 I’m so glad I’ve been helpful to you and that my birth story made you feel more confident. This made my morning! Congratulations to you on your pregnancy and I wish you a comfortable and enjoyable pregnancy and a great birth!